If you ever wander in Sherwood Forest, particularly on the Green Drive near Major Oak, or in Clumber Park, or in other woods that were once part of Royal Forests, or visit one of the early eighteenth-century royal palaces, spare a thought for a Nottinghamshire man who was responsible for their development and maintenance over 28 years. This was Sir Thomas Hewett of Shireoaks Hall, near Worksop, a man who lived through five English monarchs and worked for four of them, and who attained his career peak in his 60s. Although he left a short account of his life on his tombstone in Wales Church, South Yorkshire, no detailed biography exists. This summary of the lives of Sir Thomas Hewett and his wife, Lady Frances, which incorporates new research, has developed from a research project about Shireoaks Hall and its owners which uses a variety of sources, including Nottinghamshire Archives and Nottingham University Manuscripts and Special Collections. Thomas Hewett was baptised at Worksop Priory in 1656. Both his grandfather, Sir Thomas Hewett, and his father, William Hewett, died during his childhood so after his early years at Shireoaks (built c1615 by his grandfather) he moved with his mother Mary (William’s first cousin) and only surviving sibling to Shrewsbury to be educated amongst his mother's relatives. This was the Prince family resident in a manor house now known as Whitehall. His sister Elizabeth later became Dame Langley and lived within the remains of Shrewsbury Abbey. Later, Thomas attended Oxford University as his grandfather Hewett had done. Afterwards he became a Yeoman of the Guard for Charles II, a post no doubt useful for his Hewett relative, prominent politician Thomas Osbourne, later 1st Duke of Leeds, of Wimbledon and Kiveton Park, South Yorkshire, while he was held in the Tower of London for five years after being impeached. Shireoaks Hall in 2016. 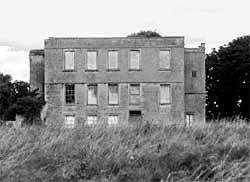 It was partially demolished in 1812 with the top storey and north side removed. After almost becoming High Sheriff of Nottinghamshire for 1686 Thomas travelled in Europe for nearly five years, during which time members of the Eyre family from Rampton lived at Shireoaks Hall. Little is known of his activities while on the continent; however, he married Frances Betenson (1667-1756) in 1689, in Geneva, then a Protestant city state. He possibly knew Frances earlier, either from her childhood spent in Wimbledon (Eagle House) near one of the homes of the Duke of Leeds, or via her mother’s (Albinia Wray) relations descended from early-17thC puritan gentry (at Glentworth and Barlings Abbey, Lincolnshire), or his distant relationship by marriage to Frances’s step-father, Samuel Oldfield, who also had early-17thC puritan connections in Lincolnshire. Revolution of 1688 that Frances was abroad in 1689. Likewise, Thomas’s relative, the Duke of Leeds, was also a major supporter of the change of monarch. Not long after returning from the continent, Thomas was commissioned as a deputy-lieutenant for Nottinghamshire (1693, renewed 1694, 1702), then in 1696 he was appointed to the post of Surveyor of the Forests North of the Trent for William III. He almost died in 1700 of an unknown illness, then in the same post for Queen Anne he surveyed and walled the new Clumber deer park (c1709) for John Holles, 3rdDuke of Newcastle. He was also employed by the Duke for two years as Surveyor of Birkland Wood, Sherwood Forest, creating the west-east straight 'ride' in the wood, while taking on the lease of a large house and farm in Kings Clipstone. This Duke of Newcastle was Warden of Sherwood Forest and also a relative by marriage of Frances Hewett. Around this time Frances was a correspondent of Lady Mary Pierrepont (later Lady Wortley Montagu) of Thoresby Hall, near to Clipstone, and some of Mary's letters to Frances have been published. Thomas's career became busier as he was additionally appointed (1714) Surveyor of Forests South of the Trent which doubled his salary. And he took on an unpaid post on the Board of the Office of Works in 1715 where he encountered the architect Nicholas Hawksmoor, originally from East Drayton, Nottinghamshire. However, he lost all his civil service posts in 1716 after complaints of financial irregularities concerning sales of Sherwood Forest timber - his name was cleared in the 1730s. In his 60s Sir Thomas was a Magistrate for north Nottinghamshire for 7 years and for Middlesex for 3 years. He was elected a fellow of the Royal Society in 1721 and was appointed governor of a Thames water supply scheme. After mid-1723 it appears he was physically restricted by a long final illness but he was able to conduct his Surveyor-General role from Shireoaks via a messenger to communicate with a Deputy (Westby Gill from Rotherham) in London. He was proud of his family name but he had no direct male heirs (his closest direct female relatives were dead) so left a long and complex will which named as the main inheritors after his wife a succession of three male associates and their male heirs, before a possible distant Hewett cousin who was a man of religion. Most of the possible inheritors were descendants of the early-17thC puritan Thornhaugh family of north Nottinghamshire (Fenton, Osberton, and Carburton). A condition of inheritance was that the name Hewett must be adopted. This condition of surname change and the deliberate exclusion of female inheritors also had been features of the Duke of Newcastle's will. After Sir Thomas died in 1726 his wife of 37 years decided to leave Shireoaks to spend most of her 30-year widowhood in Soho in the buildings which are now Hazlitt's Hotel, after which she was also buried in Wales Church. Among her sister's notable descendants is George Selwyn, the first Anglican Bishop of New Zealand, whose tomb is in Lichfield Cathedral. Unfortunately, little is known about Sir Thomas's private architectural design work which was usually undertaken for friends and associates, and almost all has been demolished. Some was in Nottinghamshire: Headon Hall (1710) for Hardolph Wasteneys, Bt, possibly the Normanton gate posts at Clumber (moved from Shireoaks in 1910), a summer-house in Shireoaks Park (finished after he died), and stables near the lake at Thoresby (1726) described by Sarah, Duchess of Marlborough as an “extreme fine building ... looks extreme handsome.” A few were further afield: a large private library in central London (1720), probably Hursley Park house and garden in Hampshire (1721-1724), another library (1724) at Shirburn Castle, Oxfordshire, and possibly others still to be attributed. Even with a great deal of new detail there are still unknown and intriguing areas of Sir Thomas's life; perhaps archives further afield will reveal more about this interesting man of Nottinghamshire.